Mormon Mommy Writers and Friends: Perfection, I must have prefection! 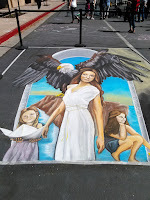 As my kids and I wandered the parking lot of the local, hip shopping center hosting a chalk art festival this weekend, I was fascinated by things people could do with several pieces of chalk and a parking spot. You can look at the pictures in this post to see what I mean. It was beautiful, it was amazing and quite frankly it was intimidating. At the center of the shopping plaza they were handing out a piece of chalk to whoever wanted to draw on the sidewalk areas not being used by the artists. 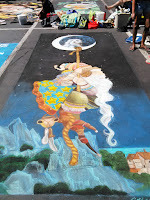 My children gladly jumped at the chalk and immediately took to the sidewalks leaving their little mark on the plaza. I reluctantly grabbed a piece of chalk and went and sat by where my kids were drawing. I thought about drawing something. 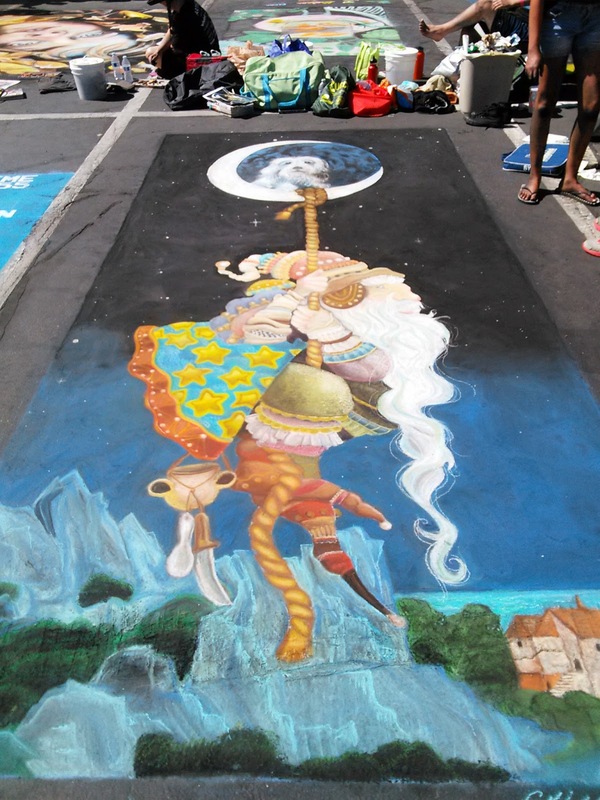 But after seeing such masterpieces in such vivid colors and detail, I looked at my single color of chalk and shrank at the task. I racked my brain trying to think of what I could possibly draw that would look nice in just one color. 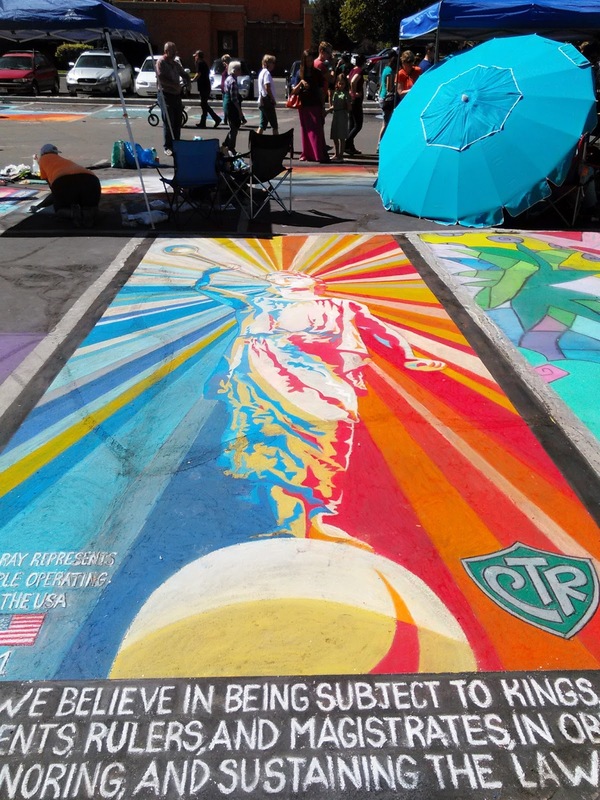 All the while, my kids were relishing in the enjoyment of the moment, with little care as to whether their drawing stacked up to even the scribbles on the sidewalk next to them, let alone the master pieces in the parking lot. Who cares? They were having fun and drawing from their heart and that is all that really mattered to them. Why couldn't I be as free as them and draw because it was fun? Sure, I still had on my work clothes from earlier that day, but I could have at least manged to squat long enough to scribble out my name in fancy letters or some cute doodle. Ah, perfectionism it is such a double edged sword. 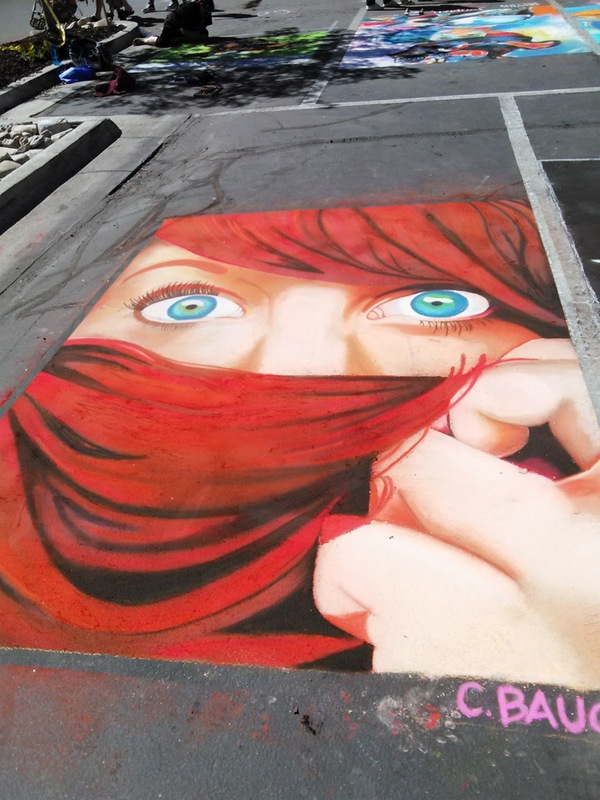 You can bet all those artists who spent hours, maybe days, slaving over their masterpieces in a parking lot stall were seeking for perfection. It is often how such amazing talent and such beautiful pieces of art come to be. And, yet, that same force which can drive an individual to do such amazing things can also cripple them from ever starting the task if it seems too difficult or they feel inferior to their competitors. Does this ever happen to you with your writing? It does sometimes for me. If I don't quite know how to make a story great, I often have a difficult time getting myself to start on it. I can also spend a week slaving over a single sentence, unwilling to move on because I know it is not perfect like I want it. 1. Great works of art and writing come in lots of different packages. Not every art that speaks to my soul is done in the same style as a da Vinci. I can be just as fascinated with a beautifully cartoonish picture book. And a comical and silly chapter book can be just as wonderful to my children as a life changing novel can be to me. So my version of writing doesn't have to look or be like the lastest New York Times bestseller to be worthwhile. 2. It's okay to be by yourself away from the critiquing eyes of others when you want to try something new. 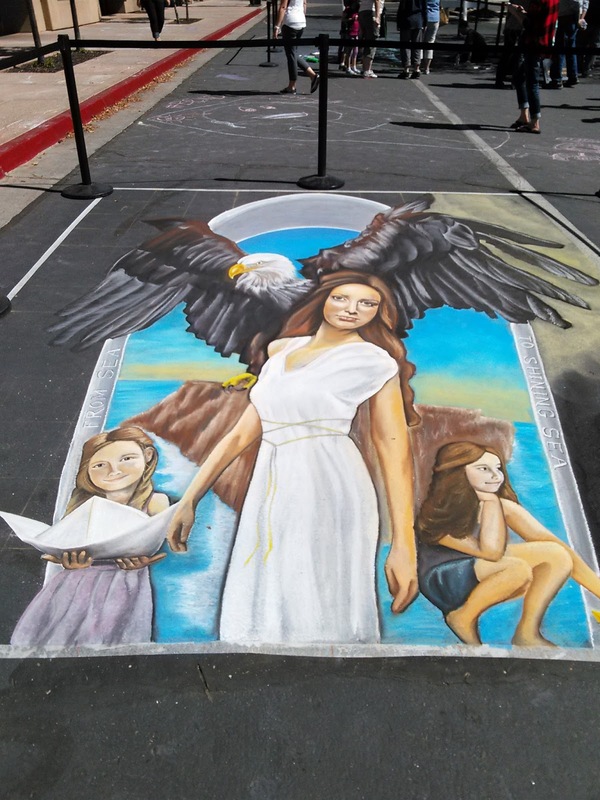 You don't have to go to the center of the plaza to attempt a chalk art master piece as long as you are willing to try it out by yourself in the privacy of your own home. Just be sure to promise yourself you will share your talents later when you are no longer a novice. 3. Even the masters had to learn to be masters. Don't look at the ending product of years of study and expect to achieve the same for yourself after only days or weeks. It doesn't mean you couldn't or can't achieve that level of skill, you just have to put in the time and effort. So what about you? Are any of you MMW's perfectionists when it comes to your writing? How has it helped you and how do you overcome the struggles? And don't worry, I'm not looking for the perfect answer. Yes! I have this problem throughout different areas of my life. Even something like house cleaning is hard to start because I don't usually have the time or patience to do a perfect job. I constantly have to remind myself that doing just a little bit is better than doing nothing. My writing project is the same way. I often edit and edit and edit never letting the project move on to any of the next stages because it's not perfect yet. But I'm trying to overcome that and have actually sent my current project out to a small publishing company. No, it's not perfect, but it will be my first published novel if I get a contract. And I am trying to remind myself that my first novel doesn't have to be perfect. Yup, totally me and house cleaning too. That is great, though, that you have submitted your first novel. Yay, go Nikki!